This Tree guides you in reducing intra-group conflict so as to restore social harmony and sustain group cohesion following an explosion of hostilities. This account is not a full exploration of psychosocial issues. It's purpose is to demonstrate that THEE is a model whose exploration generates findings that did not go into its construction. The specific aim is to scientifically validate conjectures developed in relation to the reversal of the oscillating duality and the identification of Root Level pressures of presumed biological origin. See more here. Approach to Exposition: The Tree emerged fully developed and so the usual logical methods of exposition are not appropriate. See more here. 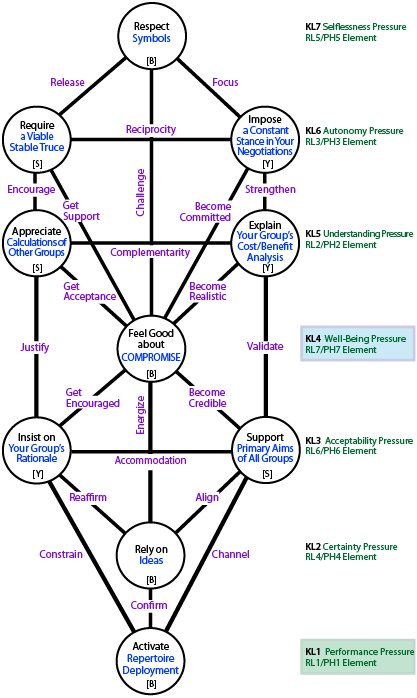 Note: The main Well-being level in this emergent framework appears to be KL1: Repertoires because performance of one or other of a variety of available options by a sub-group caused tensions to escalate. Use of a repertoire is the basis for actions enabling subsequent reconciliation. It may help to read this part first. There appears to be a move from principles down to practices. The two extreme Centres are oriented to the group's divisions: at the top (KL7) you accept all sub-groups, at the bottom (KL1) you make responses to each and all. The other two Centres are oriented to the group-as-a-whole: the upper (KL4) enables group adaptation, the lower (KL2) deals with ways to heal and re-unify. In this central spine, the yourself v your situation duality is fused. the ideas-KL2 that are so important must be appropriate to the situation, resonate with the whole group and with sub-group members. the repertoires-KL1 that you activate must handle sensitive issues and respond to needs generally. KL7B ↔ KL4B: Respect for symbols-KL7B challenges whether you are compromising-KL4B; and vice versa. KL4B ↔ KL2B: Your compromising-KL4B energizes the ideas-KL2B that you use with the members; and vice versa. KL2B ↔ KL1B: The ideas-KL2B relevant to the issues confirm the deployment of repertoires-KL1B; and vice versa. Symbols express group affiliation because they depend on sharing an experience of functioning within an enduring group. The group is meaningful for its members and the symbols come to stand for the group. Their use is reassuring for members and serve as a basis for group well-being. By respecting the symbols you respect the group and respect members. That does not imply agreement with the group's ideas or demands. It is rather a ceremonial respect that is the basis for civility, which in turn is necessary for working out any resolution and the restoration of harmony. Unfortunately, in breakdowns of this sort, symbols may well evoke abhorrence and stimulate wishes to annihilate the other. This is commonly found in politicians. However, when it comes to symbols, refusing to privilege your own sub-group or the group-as-a-whole is an expression of selflessness. So the role here is that of a diplomat who rises above automatic egotistic reaction through a professional selflessness. Respect and civility naturally reduce tensions in conflict situations and so contribute to well-being. Respect depends on is an expression of every group's right to an independent existence. Respect for symbols allows you to focus on a constant political stance-KL6Y, and demands that you require acceptance of the status quo ante-KL6S. Respect for symbols will also challenge your compromising-KL4B. Compromising involves an expectation of specific concessions from particular sub-groups and general concessions in relation to the group as a whole. These general concessions affect all sub-groups but not always equally or fairly. However, the crucial factor in compromises is how you and others feel about them. Neither rationality nor justice are as relevant as what will reduce tensions and hostilities and be tolerated by all. Compromising commits you to remain constant in your baseline negotiating position-KL6Y, and it gets support from acceptance of a stable truce-KL6S. Compromising requires you to become realistic about the your group's cost-benefit analysis-KL5Y, and it gets acceptance through your appreciation of calculations made by other groups-KL5S. Compromising is boosted by your promotion of the rationales of all groups-KL3: support for other groups-KL3S develops credibility, while insisting on your group's raison d'etre-KL3Y is encouraging. Your compromising challenges respect for symbols-KL7B, and energizes your ideas-KL2B. The key notion here is win-win: Well-being is derived from the satisfaction of winning what you want in a negotiation. However, when negotiators are mutually inter-dependent (i.e. part of an enduring larger group), then win-win is the only resolution that makes sense. See more. Note that this Centre contains the well-being element (PH-L4) at the well-being level (KL4) in the Tree. Good ideas are essential to generate a way forward. You will develop or discover ideas about what is possible and you must depend on these to provide you with certainty in negotiations. The relevant ideas may be part of the history of the larger group, of the emergence of a particular sub-group, or be current in wider society. They may be part of a theory or paradigm that has particular resonance. Useful ideas will energize your willingness to compromise-KL4B. They will also reaffirm those your group's rationale-KL3Y, and align with support for all groups-KL3S They must confirm the deployment of available repertoires-KL1B. The leadership of any group has a variety of powers and resources at its disposal. So there are a range of responses available to be deployed at critical moments to deal with a sensitive issue or a difficult member or another group leader and increase the sense of well-being. Some of the performance possibilities at your disposal may be feared or hated, so refraining from using these may also send a reassuring signal. Groups do not function in a logical way, because their members become dominated by emotions and beliefs. They therefore respond primarily to actions that prove their views have been taken into account and symbolizing that their values are being respected. See more about groups. The various repertoires available to leaders can be used to confirm the ideas in play. They channel (and are channeled by) support for the primary aims of all groups-KL3S, and constrain (and are constrained by) your own group's rationale-KL3Y. The other three levels—KL6, KL5, KL3—have two Centres each: these must take heed of each other and connect to the Centres on the spine. Stability is preoccupation for any group. At a time of turmoil, a stable background allows issues to be aired, difficulties to be discussed and compromises to be negotiated. From your perspective, you can contribute by providing for a constancy and dependability in negotiations. However, that is of little value unless there is a truce in place that allows for the viability of all groups involved. These two Centre conditions need to enable a reciprocity in dealings. In order for satisfactory compromises to be developed and negotiated, it is necessary that you find a baseline position and keep it constant. This position will revolve around what your group wants. It will demonstrate both that you view compromising as necessary, and that your have a position which relevant for all concerned. Political constancy is comforting and calming for your members as well. A constant negotiating stance ensures you become committed to compromising-KL4B. It also strengthens your explanations of costs and benefits for your group-KL5Y; and it gives you confidence to focus on respect for symbols-KL7B. Whether the entity is a golf club, a firm or a professional association, it needs to continue functioning for its members, and sometimes for its continuing survival. So a stable truce is required, with intra-group hostilities under sufficient control to allow for viable operations. All sub-groups need to agree to a particular status quo within which negotiations can proceed and into which new arrangements can be introduced. Often the easiest stable position is the status quo ante i.e. before the blow-up that caused the tensions. The required stable truce must demand respect for symbols-KL7B, encourage appreciation of other groups' calculations-KL5S, and support your compromising-KL4B. Tensions blow up when group costs increase or group benefits decrease, so cost/benefit analyses are necessary to track well-being. So a group's leadership is expected to have quantified information on its activities, resources, finances, member participation, and whatever else is relevant. These are yardsticks for tracking any changes that are proposed, instituted or emerge unexpectedly. Measurements are used as evidence, but the figures need understanding so that they can be explained from the group's perspective and in terms of its values. At the same time you need to appreciate how other groups (or their politicians) calculate matters. As a political leader, you are expected to be aware of how your group is winning or losing in terms of costs and benefits of group membership. Your task is to explain your group's current balance as clearly as you can because you will be using this information to manage negotiations. At the extreme, your group might wish to become free-standing rather than endure certain inequities. Explaining how your group analyses costs and benefits helps to ensure compromising-KL4 becomes realistic. It validates your support for the basic aims of all groups-KL3S, and strengthens the constancy of your negotiating position-KL5Y. The distribution of rewards, benefits and social goods as well as the burdens, costs and social disadvantages are a primary concern for any political leadership. In politicized environments, the various sub-groups (or at least their political leaders) are all acutely sensitive to the balance. Issues of fairness often vie with desires for advantage or superiority. In any case, every change and every proposals is subjected to this calculus, and it must therefore be appreciated. Appreciating calculations of the politicians in other groups encourages your maintenance of viable stable truce-KL6S while compromises are being worked out, helps in getting acceptance of your compromises-KL4B, and should justify insisting on the value of your group's rationale-KL3Y. Principal objects are those ongoing activities that define the identity of an entity like a group, organization or project. They are a rationale for existence i.e. the raison d'etre. To be a member (insider) is to feel good about these defining aims (often called primary goals or the mission) and the well-being of membership applies to sub-groups as much as to the encompassing group. Members of sub-groups can be assumed to support the encompassing group's objects as well as their own—indeed they must do so if that group is to survive. So the effort here goes into promoting all primary aims, ensuring that every group takes all other groups (including the encompassing group) into consideration. The emphasis has to be on supporting all groups because this maximizes survival and cohesion. The principal objects that define the identity of each sub-group must be fully supported. You must ensure those members realize that there is no threat to their existence. Without this support from you, members are likely to leave en masse and set up their own organization. This support for the rationales of all groups provides credibility for your readiness to compromise-KL4B, and validates the way you explain your own group's costs and benefits-KL5Y. Support should align with useful and necessary ideas-KL2B, and channel deployment of repertoires-KL1B. Insisting on the rationale of the group you lead encourages you to keep compromising-KL4, and justifies your appreciation of the calculations made by other groups-KL5S. It also reaffirms the appeal of relevant ideas-KL2, and constrains how you deploy your group's repertoire-KL1 of responses. Further notes on this framework. Continue to Resolving Interpersonal Differences: the Tree of PH-L5s from PH4-Experience that helps you affirm a solid bond in close relationships. Previous updating: 24-Mar-2014. Last updated 24-Jan-2015.